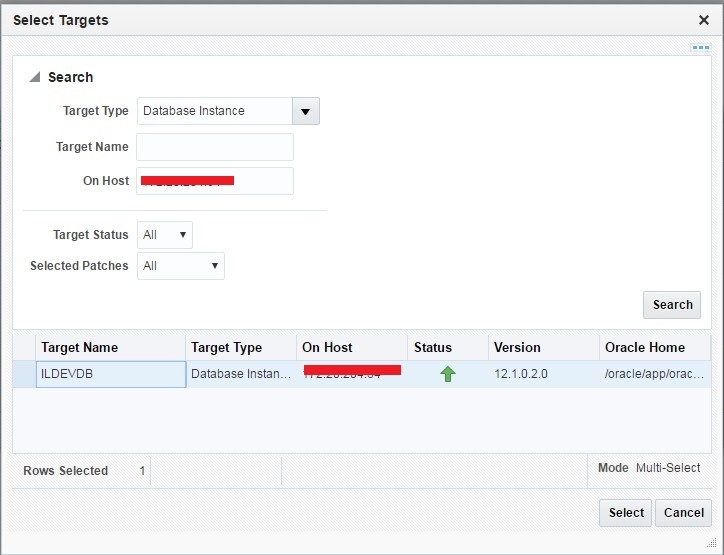 With help of OEM cloud control, we can apply patch on multiple databases easily. No need to download the patch and copy that to the database server, OEM will download the patch if require and do the rest of patching activities. Below are the steps for applying patch using OEM Cloud control. Select the respective platform and database. Select the database targets. You can select multiple databases at a time. This is screen is very important. There are two types of patching mode. – Out of place – In this option, A new Oracle binary will be created and the patch will be applied on top of that. And database will started from the new Oracle home. This is recommended method, because, it reduced DB downtime and also during patching to binary if some issue happens, then also the old ORACLE_HOME is intact. – In place – Here the database and listeners running from that home will be shut down , Then patch will be applied to that ORACLE_HOME, once done database will be started with post patch. Here I have selected In place. Set the ORACLE_HOME credentials , If not then use override and set the database server host username and password. Now run the validation, to check the conflicts. This validation shouldn’t show any errors. Now the validation is successful, Now go for DEPLOYMENT. With this patching has been completed. Now you can log in to the database and check the patch registry. What is your OMS database version? So I want to ask is it possible to patch 12.2.0.1.0 database with OEM 13C or not ?